After a technical review of the latest Nigerian Maritime Administration and Safety Agency (NIMASA) Medium Term Strategy plan, industry analysts have discovered that it was not developed with development of local shippers in view. This is based on the fact that few months after the launch of the plan, there had been no sign for the disbursement of Cabotage Vessel Financing Fund (CVFF) or The Maritime Fund (TMF), all statutorily managed by the agency to develop indigenous shipping capacity in Nigeria. However, the spirit of the plan in terms of developing local shipping capacity which does not exist was relied upon by the Director General, Dakuku Peterside to claim at the ongoing 120th Council meeting of the IMO in London, that Nigeria will continue to seek continued technical cooperation and support from the International Maritime Organization (IMO) in order to build up sustainable capacity. While arguing that the IMO cooperation will help Nigeria to be a globally competitive maritime nation, analysts say Nigerian shippers can only become truly competitive when the capacities of local shippers’ are truly supported by facilities from the CVFF and TMF which NIMASA had denied them for years. An exact picture this scenario was painted Thursday by the President, Ship Owners Association of Nigerian (SOAN), Engr. Greg Ogbeifun at a Stakeholders Forum organised by the Alumni of Maritime Academy of Nigeria, Oron (AMANO) in Lagos, when he averred that unfavourable economic policies and lacklustre maritime administration may have resulted in painful reduction in the number of vibrant shipping companies operating in Nigeria, by a massive 42 percent, within the past three years”. He decried that with the steady and painful contraction of shipping companies, a multitude of seafarers were also, reluctantly thrown into the Labour market, with its attendant socio-economic implications on both the families and the nation. Ogbeifun, who spoke on ‘Urgent Call to Re-think Maritime Education and Training’ in his presentation, noted that the unfavourable policies had made shipowners weak, vulnerable and grossly incapable of adequately pulling their expected weight, in the task of building up the economy; even as some areas of Port Harcourt now look like a mortuary for ships. Engr. Ogbeifun explained that whereas every shipowner has a natural desire to pamper his workers, the seafarers; as treasured geese laying the laudable eggs, however for most shipowners who are currently fighting for survival, especially in view of staggering and intimidating bank debts, there is limit to what they can do. He also said he had read the controversy on the online publications in respect of the ragging issue of Collective Bargaining Agreement (CBA) and posited that it would be extremely hard for shipowners currently fighting to remain afloat and breath, to append their signatures on such document for now. Peterside noted that technical cooperation will help build up knowledge and the necessary skills to position Nigeria as a maritime nation that operates in line with global best practices. Speaking further, he noted that the Agency’s area of interest for seeking technical cooperation includes; domestication and ratification of IMO legal instruments, environmental stewardship and safety issues. 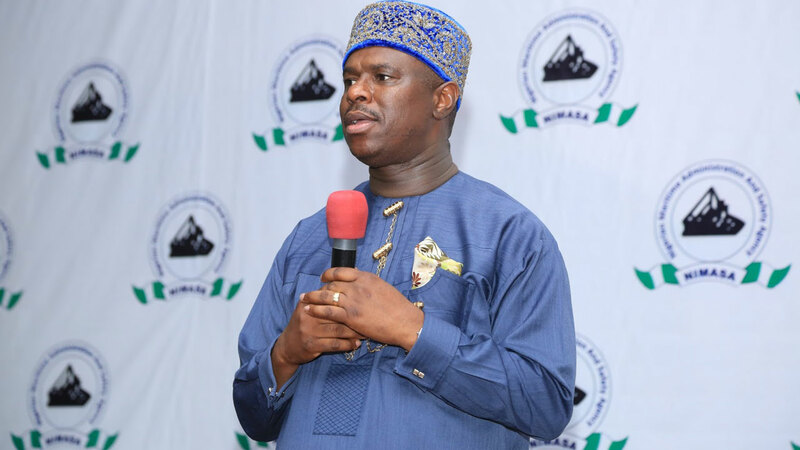 While expressing the willingness and determination of NIMASA to ensure that Nigeria is given its rightful place in the comity of maritime nations, industry experts noted that Nigeria can only take its rightful place just in the nearest West Coast when indigenous shippers’ are supported by the agency in line with the provisions of NIMASA Act. Business Hilights gathered that efforts of all the shipping associations to have access to CVFF and TMF in the last three years have proved abortive even as the DG of NIMASA kept attending any kind of conference on maritime both at home and abroad. R-APC: Has arrow of god appeared in APC as things are no longer at ease or…?